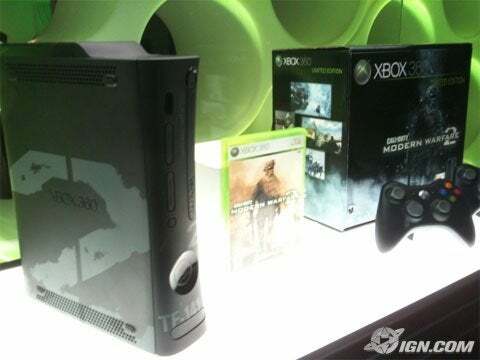 During the Infinity Ward press conference going on in Los Angeles tonight, the company revealed a new limited edition Modern Warfare 2-themed Xbox 360 bundle featuring a 250GB harddrive, two wireless controllers, and a copy of the game. The bundle is available for pre-order now and retails for $399. "It's the highest compliment to the team and our fans to have a special themed Xbox 360 console," said Vince Zampella, CEO of Infinity Ward. "The precision and detail that's been put into the console captures the intensity and feel of 'Modern Warfare 2.' We can't wait for our community and fans around the world to see for themselves on Nov. 10." This news comes just weeks after a similar 250GB Forza 3 bundle was spotted on Amazon Germany. And for more news from the night, check out IGN's liveblog. And be sure to check back later for our hands-on preview later tonight. And it gets released over here! Sounds awesome. I've got to admit, that looks very tacky, for the price! What call of duty game is the most popular online? Can any modern video games be considered classics?